By the author of the New York Times Love and Relationships bestseller How to Be a Person in the World, an impassioned and inspiring collection about the expectations of modern life and the sweet imperfections of the everyday. Heather Havrilesky's writing has been called "whip-smart and profanely funny" (Entertainment Weekly) and "required reading for all humans" (Celeste Ng). In her work for New York, The Baffler, The New York Times Magazine, and The Atlantic, as well as in her advice column for The Cut, "Ask Polly," she dispenses a singular, cutting wisdom--an ability to inspire, provoke, and put a name to our most insidious cultural delusions. What If This Were Enough? is a mantra and a clarion call. In its chapters--many of them original to the book, others expanded from their initial publication--Havrilesky takes on those cultural forces that shape us. From the enforced cheer of American life to the celebration of survivalism, from the allure of materialism to our misunderstandings of romance and success, Havrilesky deconstructs some of the most poisonous and misleading messages we ingest today, all the while suggesting new ways we might navigate our increasingly bewildering world. 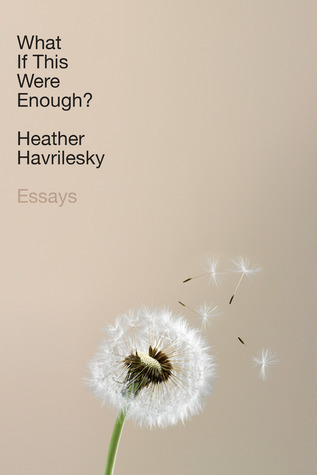 Through her incisive and witty inquiries, Havrilesky emphasizes the importance of locating the miraculous within the mundane. In these timely, provocative, and often hilarious chapters, she urges readers to embrace the flawed--to connect with what already is, who we already are, what we already have. She asks us to consider: What if this were enough? Our salvation, Havrilesky asserts, can be found right here, right now, in this imperfect moment. Title : What If This Were Enough?